Inspired Classrooms has been brought to you by the following very talented team, supported by many people from across the Diocese of Norwich. In particular we have worked with a hugely creative group of teachers from the Aylsham Cluster Trust, who have helped develop the Toolkit lessons, challenges and practical resources. Thanks also to the Aylsham & District Team Ministry who continue to be fabulously supportive of Inspired Classrooms. To contact any member of our Toolkit Team, please click here. It has been a great pleasure for me to lead the Inspired Classrooms team over the past two years as we have steadily designed and built this amazing resource. My work has included developing the original project vision, securing its funding and then managing and coordinating all aspects of its delivery. The great joy of this has been in meeting and working with many highly creative people of all ages in truly inspiring surroundings. Our hard work continues though as we monitor, evaluate and update the Toolkit, seeking further funding for its growth and ongoing development. My background is as a teacher of secondary History and RE with a BA (Hons) in History and an MA in Museum and Heritage Studies. I was Head of Education at Norwich Cathedral for 9 years between 1999 and 2008, overseeing the expansion of its learning programme to national significance. I have also been an Expert Adviser for the Heritage Lottery Fund and now work freelance as a heritage and community learning, interpretation and funding specialist, advising a range of organisations - community, cultural, heritage and environmental. This work focuses on widening access and participation to heritage with a focus on learning and community engagement and my clients include parish churches, abbeys and cathedrals amongst others. I have been Chair of Governors at Worstead VC C of E Primary School in North Norfolk since January 2014. As Lead teacher I have thoroughly enjoyed creating the resources for schools and churches and supporting the design and functionality of the website. It has been a joy to work with the teachers, children and ministry team. We have been inspired to create something which we hope will inspire you to get out of the classroom and use the fabulous resource - The parish church - to support learning. Away from Inspired Classrooms I am an experienced secondary and post 16 teacher and senior leader. I have an MSc in Education, Leadership and Management and over 19 years of providing the vision and leadership required to ensure high quality education for all pupils. I am currently working as an education consultant supporting middle and senior leaders with school improvement and as a progression specialist with Causeway Education, working one to one with sixth form students. I am an experienced Chair of Governors. It has been a pleasure to work on this innovative project. As Deputy Lead Teacher I have ensured that all the plans, resources and supporting documents in the Toolkit are relevant and effective for today’s busy teaching staff. As a fellow primary teacher, I recognise the value of resources which provide ideas and can be adapted and/or differentiated for the individual needs of learners. 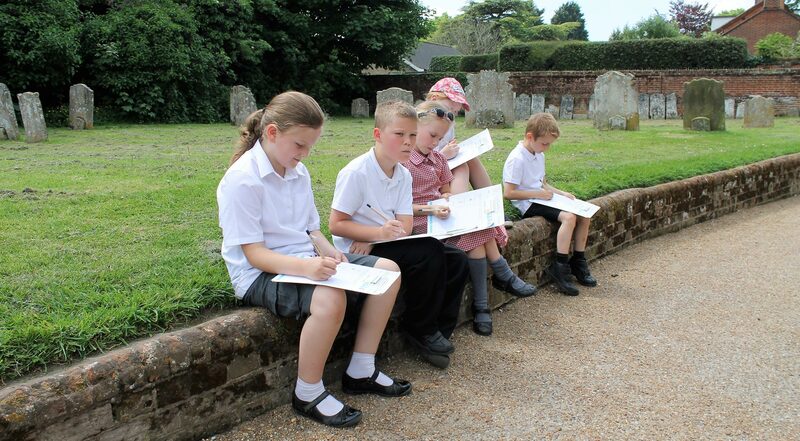 This free online resource will inspire schools to reassess the use, perception and potential of our rich heritage of church buildings, whilst also empowering churches to be better prepared when receiving school visits – which ultimately improves the learning and outcomes for our learners. I am a passionate primary educator and senior leader with a broad experience of improving opportunities and raising attainment for pupils. I have a BEd (Hons) in Primary Education and worked for 14 years at a large East London primary school, where I undertook a range of class and non-class based roles, culminating in Deputy Headteacher and LA advisor. My school was graded ‘Outstanding’ by Ofsted in 2015. Since moving back to Norfolk with my family, I am now a freelance education advisor, on projects such as Inspired Classrooms, I teach part time at an infant school, undertake 1:1 tuition at a junior school, support the Children’s Team at my local parish church and fundraise for numerous charities. Inspired Classrooms is a wonderful initiative and brings together two areas I am strongly interested in – schools and architectural heritage. I have had the privilege of taking responsibility for the project’s photography, allowing me to work closely with the project team and assist during INSET and trial lesson days. Our church building heritage offers an unparalleled learning environment for our children - on our doorstep, but often overlooked. This project ensures these great buildings continue to be at the heart of the communities they have served for centuries. I work as a designer, photographer, writer and advisor for schools and churches. I have a BA (Hons) History of Art and an MA in Architectural History. My career has included working as a specialist at Christie’s auction house in London, focussing on C20th Design and Decorative Art, and working in education as an Inclusion and Marketing Officer at a primary school in London. Since moving back to Norfolk, I now work freelance supporting schools and churches in Norfolk and London. I am a governor at a federation of three local schools and am a Parish Councillor at my parish church. Having been part of the award-winning design team that rebranded and provided a website for Norwich Cathedral, I was appointed by Saul Penfold for further design work on the Inspired Classrooms initiative. Working closely with Morgan West, we have also provided design and websites for the NHS, schools and other organisations in the public sector. I am responsible for creating the Inspired Classrooms website and associated offline "web app" linked via the QR codes. I run a website design company called Studio Blip, specialising in bespoke Content Managed Websites which are designed to be maintained by non-technical administrators. Proficient in many programming languages I work closely a with a team of trusted creative individuals, such as graphic designer José McGill and Photographer Dave Guttridge. We are very grateful to the following teachers from within The Aylsham Cluster Trust, who have worked extremely hard in creating the cross-curricular lessons and supporting resources contained within this Toolkit. Thank you! We are very grateful to the following clergy and churches who have supported this Toolkit from the very beginning.